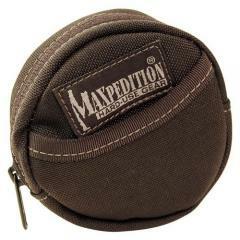 Keep canned foods, medical supplies and other field essentials close and accessible with the Tactical Can Case from Maxpedition. Whether camping, on a mission or completing odd jobs around the home, reliable equipment access is crucial. Perfectly sized to house and protect a variety of small tools and supplies, the weather-resistant case serves as an exceptional means to organizing gear. A spacious main compartment offers nearly 15-cubic inches of storage space. The interior padding and internal elastic strap offers secure item retention, preventing irritating jangling and movement. A smaller exterior pocket provides storage of compact everyday carry items. Fits: Canned foods/tins, bandages, bubble tape, etc.